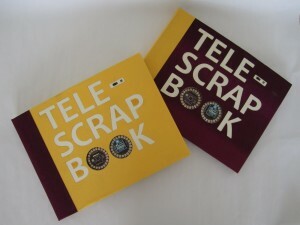 The Telescrapbooks are remote-communicating electronic sticker books. 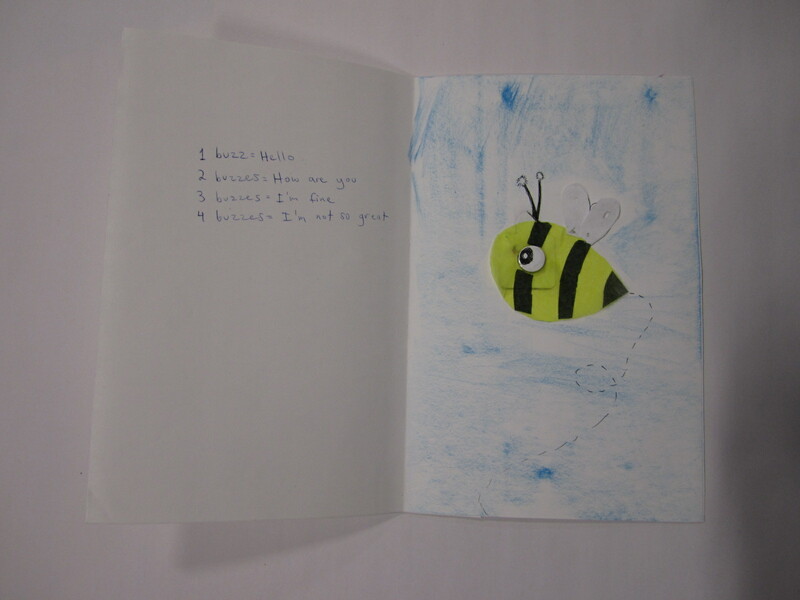 They are constructed to look and feel as much as possible like traditional books, and to be completely customizable and craft-able. 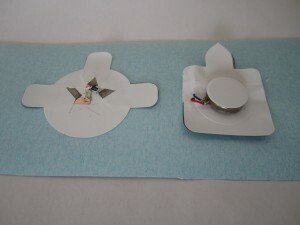 The idea is for people to be able to design a personalized remote communication tool for themselves and someone they care about. 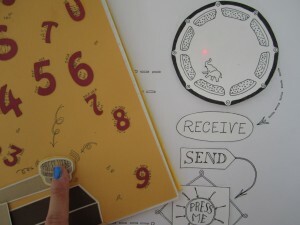 This project combines Communicreate, my first pass at a “remote communication construction kit,” and Jie Qi and Ed Baafi’s idea of electronic stickers. 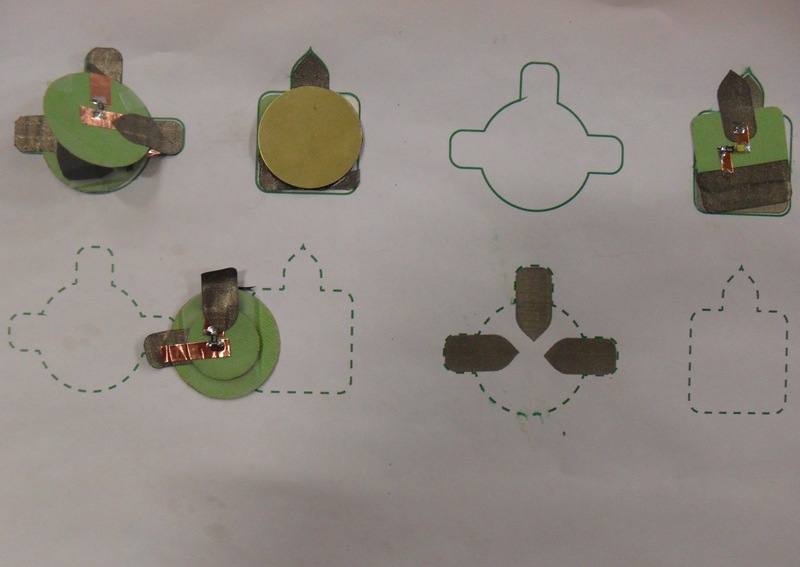 Jie and I brainstormed ways to fix the form factor problems, and decided to make the construction method sticker and papercraft — something familiar and easy, but also leaving tons of room for creativity. 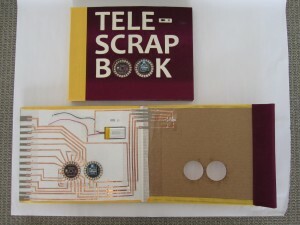 Adam joined us with ideas and mad coding skills, and together we made the Telescrapbooks and IOStickers. 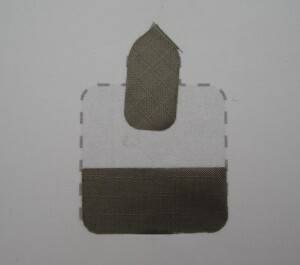 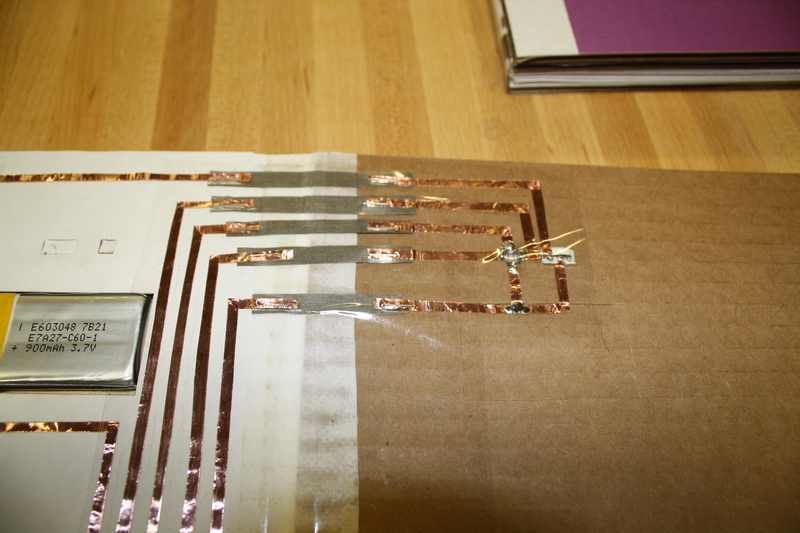 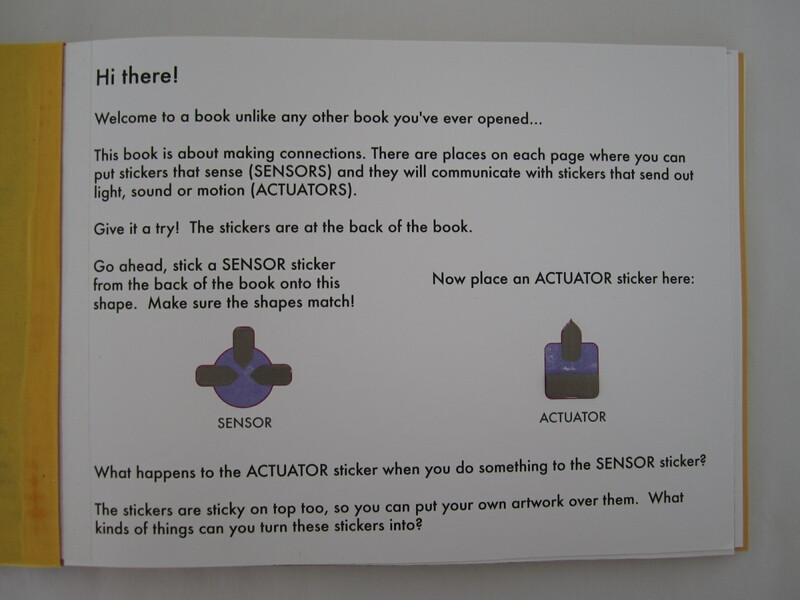 Each page has a sensor sticker footprint and an actuator footprint. 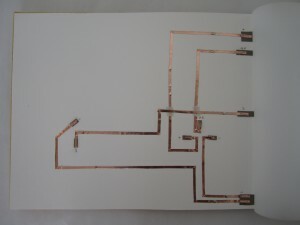 These are connected via traces on the back of the page to a microcontroller. The back of the book has a page of IOStickers, electronic sensor and actuator stickers. 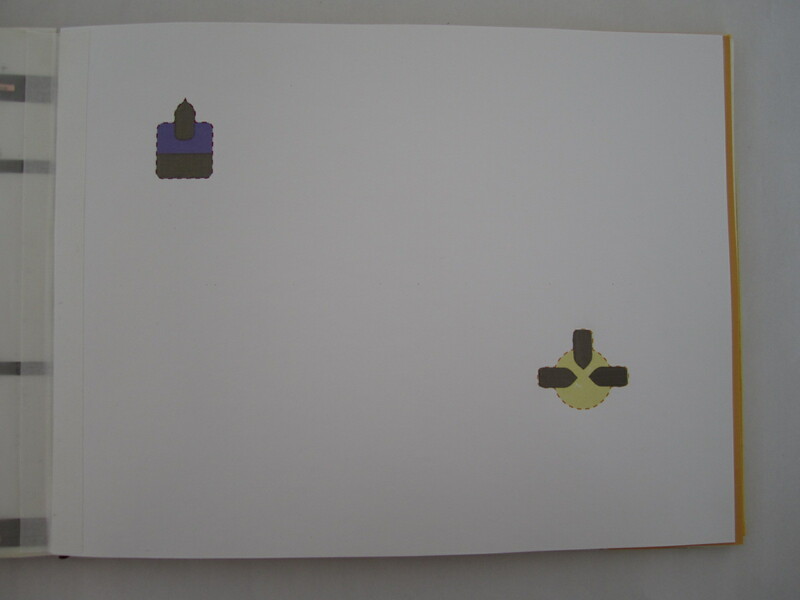 These stickers can be placed on the footprints on the book pages. 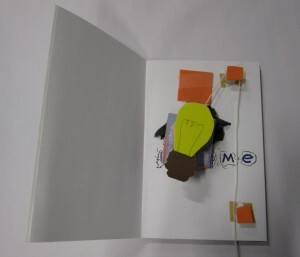 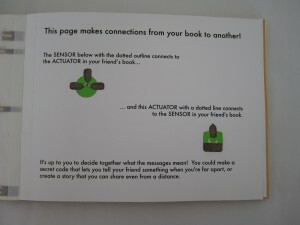 To teach the concept, the book opens with a local connection page. 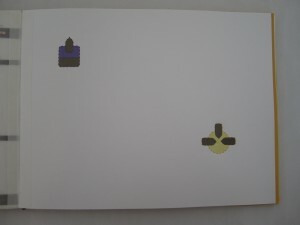 The pages following actually send and receive values from the other book. 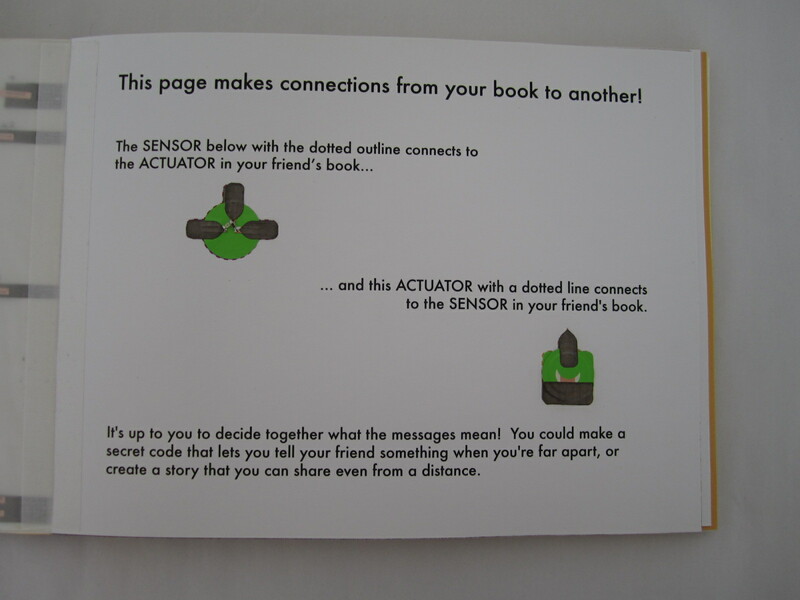 So when you affect a sensor on one page, the actuator on the corresponding page in the other book will activate. 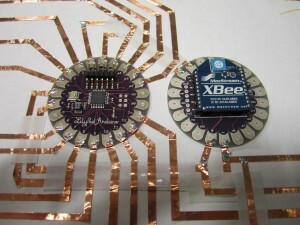 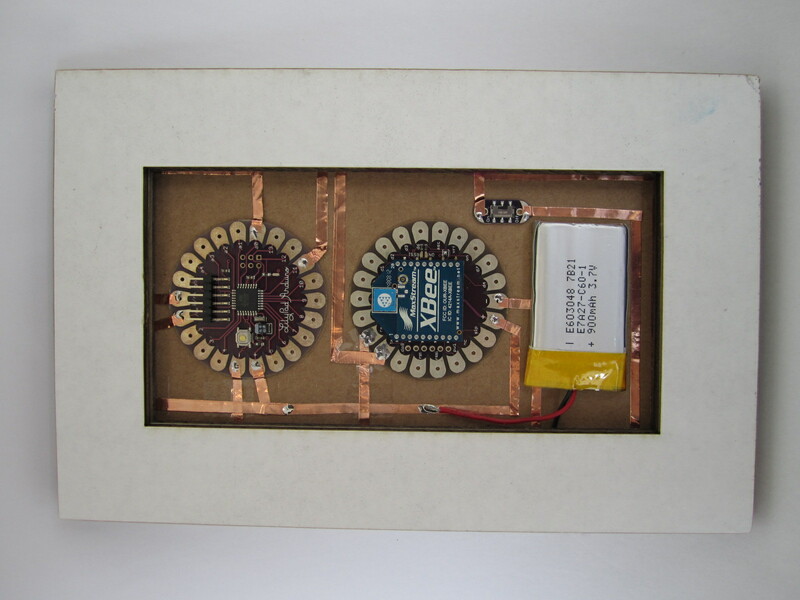 Currently the communication is limited to the range of the Xbee radios, but our next step is to make the books go through a computer or phone so they can be connected at any distance. Here’s a page we decorated, covering the stickers. 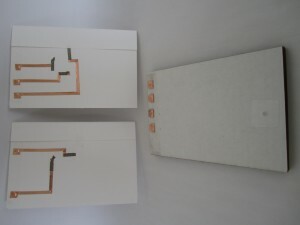 Jie made the white one and I made the messy one! 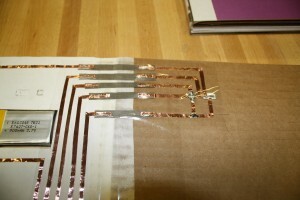 Here are some more pictures of the electronics. 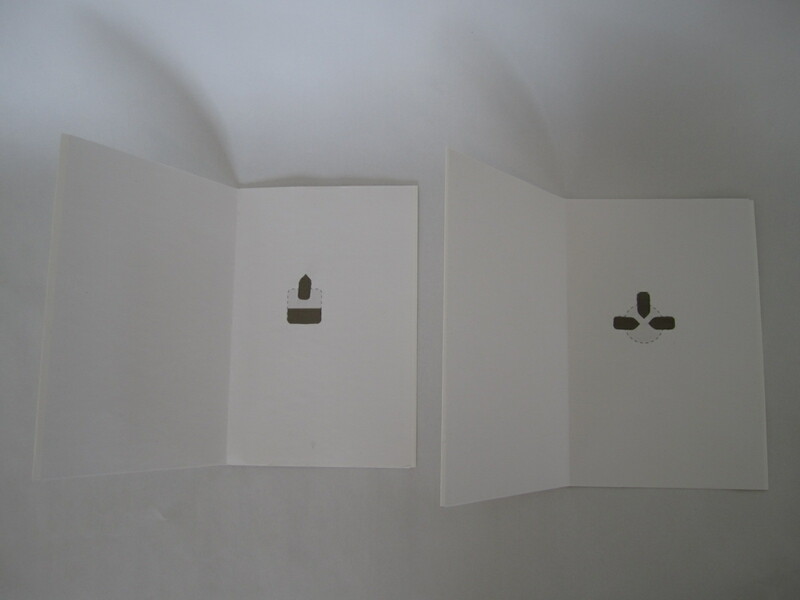 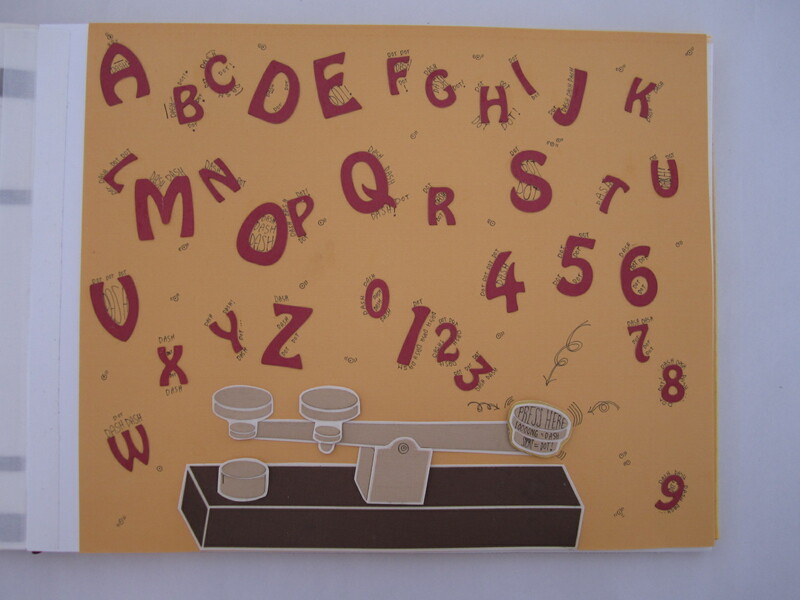 So that we could let more people make their own pages, we designed Telepostcards, the greeting-card version. 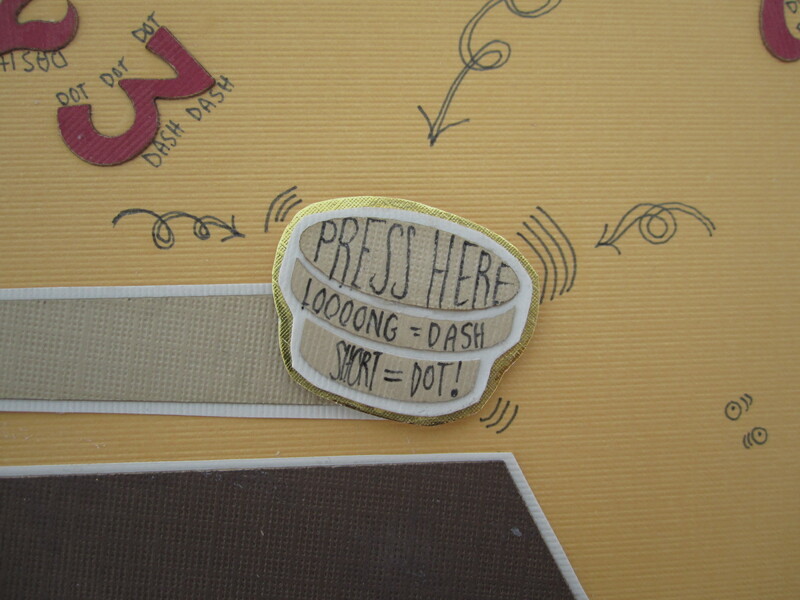 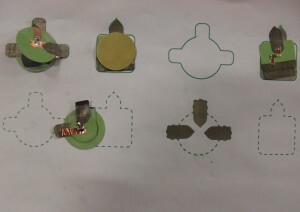 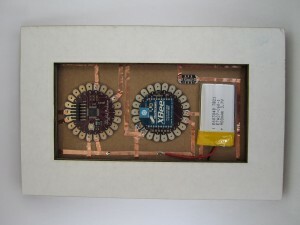 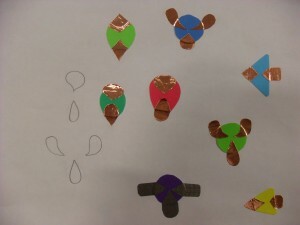 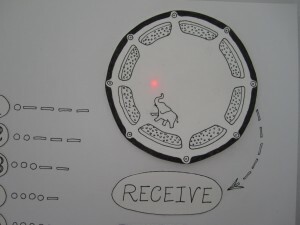 The cards have circuitry that goes from the sticker footprints to magnets on the back that snap onto a removable board containing all the communicating electronics. 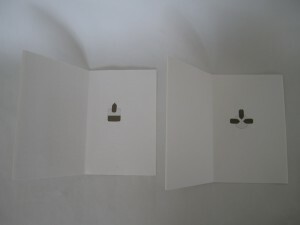 Here are a few of the cards our user test participants made. 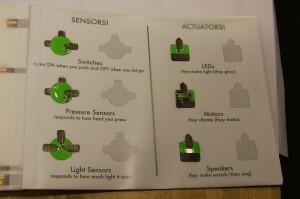 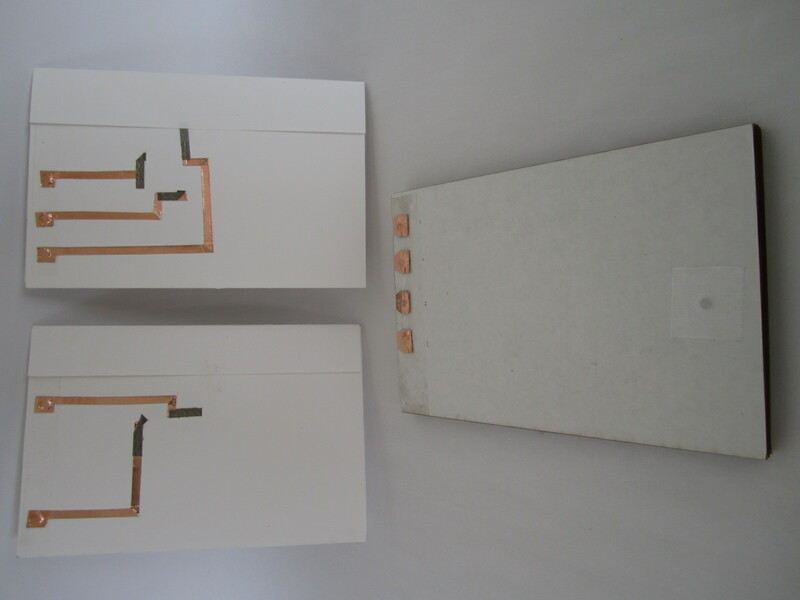 I/O Stickers is an electronics construction kit made up of adhesive sensors and actuators. It is designed to empower users to create electronics while also leveraging existing skills in craft, resulting in works that are creatively expressive as well as technically sophisticated. The basic idea is that users can place special electronic stickers onto contact points in pre-wired and preprogrammed pages, and the pages will transmit the state of the input (sensor) sticker to a corresponding output (actuator) sticker. 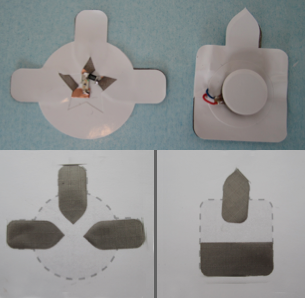 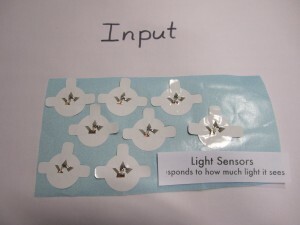 Users can design the interaction by choosing the sensor and actuator stickers, and then personalize the interface by decorating over the flat, electronic stickers with their choice of craft materials. 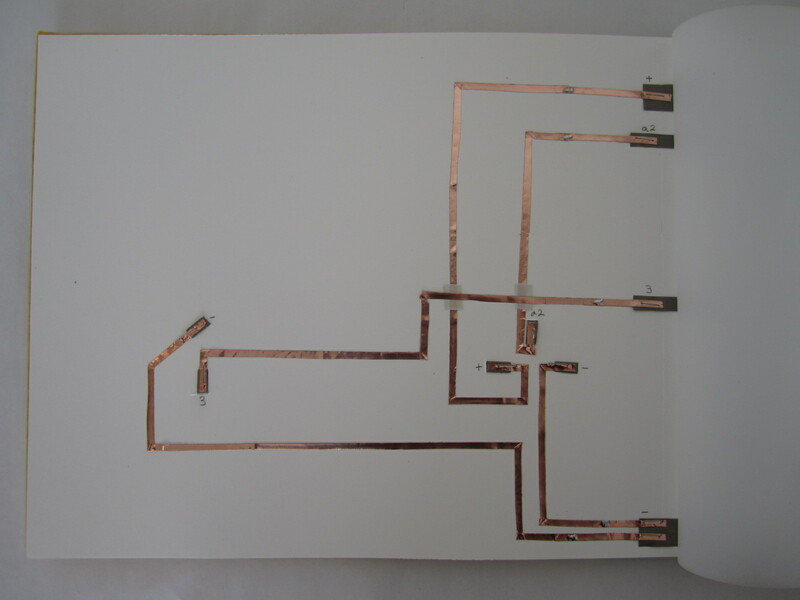 And here’s the routing in copper tape on the back. 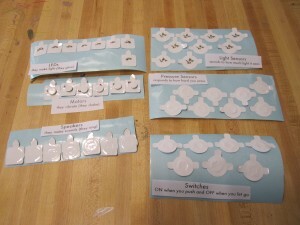 These are some pictures of the design evolution, from shape ideas to functional stickers. 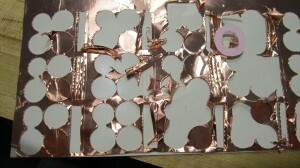 The idea for “electronic stickers” comes from Jie Qi and Ed Baafi. Photo of the very first prototype forthcoming. 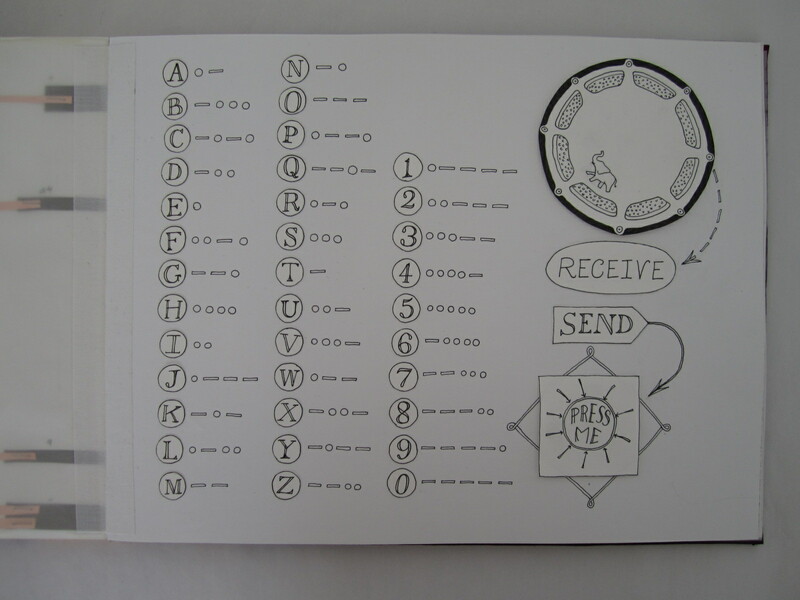 In the latest version, we made the stickers white so they would blend in with the blank page and encourage people to cover them with their designs. 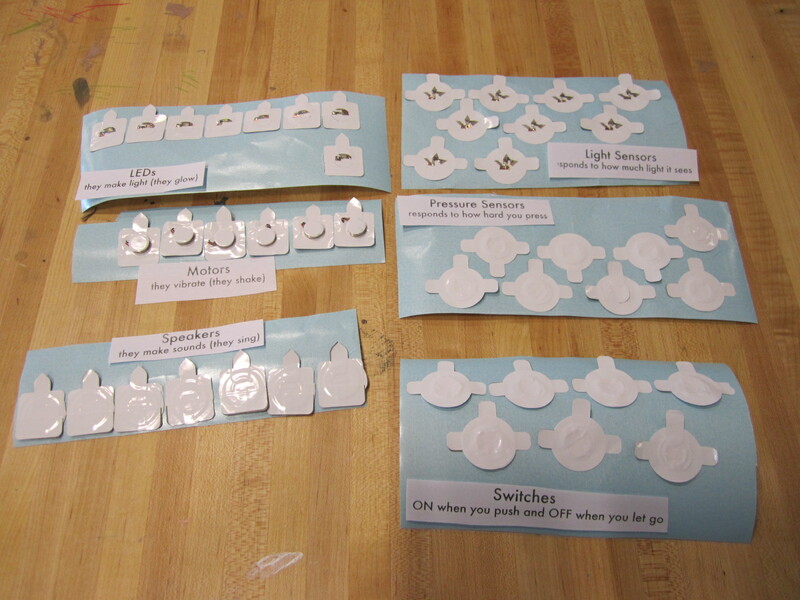 Here are some examples we made of covered stickers. The first and third are buttons and the second is an LED. 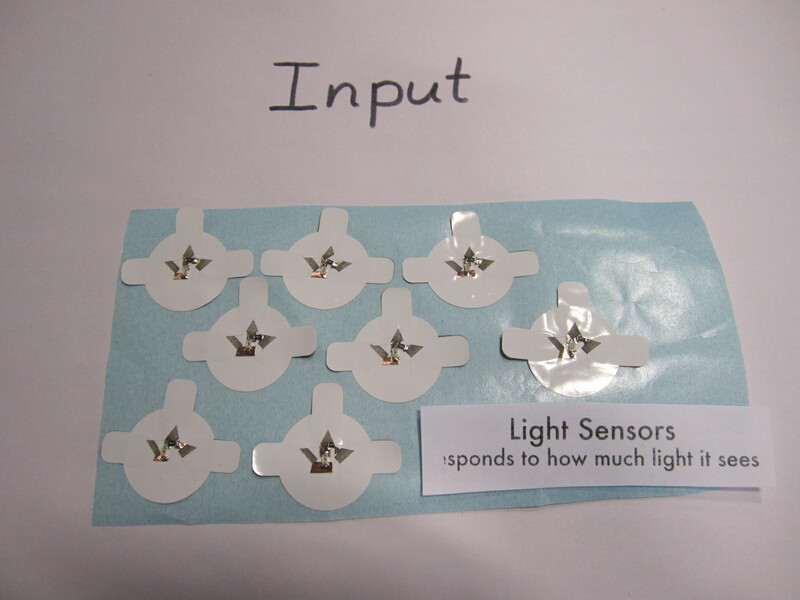 There are currently 6 types of stickers: the sensors are buttons, tilt switches, and phototransistors (light sensors), and the actuators are LEDs, vibration motors, and piezo speakers. 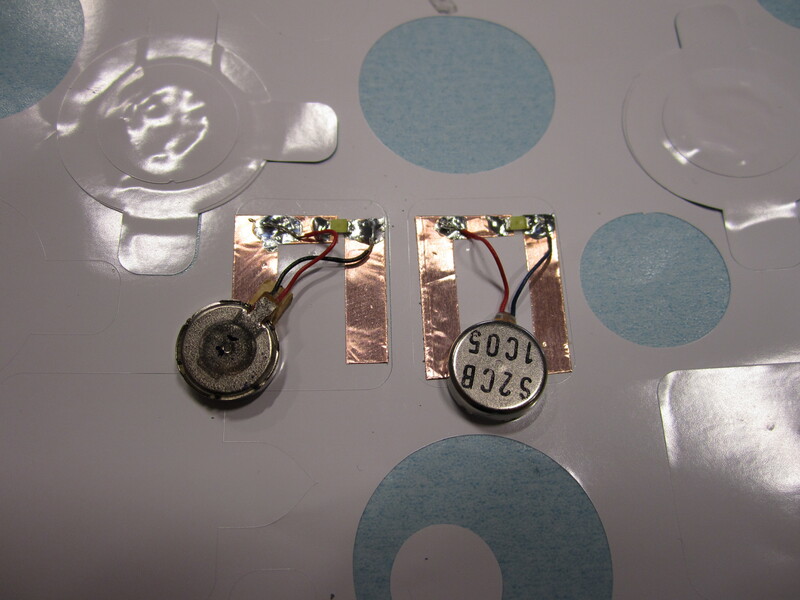 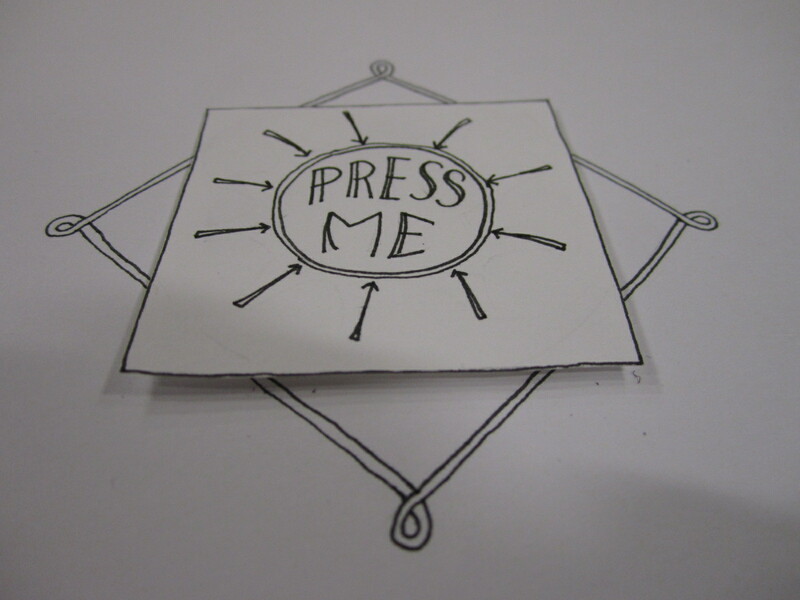 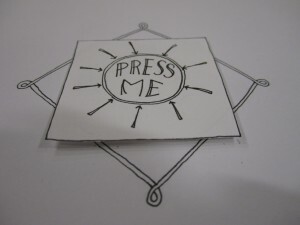 We also originally made a pressure sensor, but it doesn’t work very consistently yet. 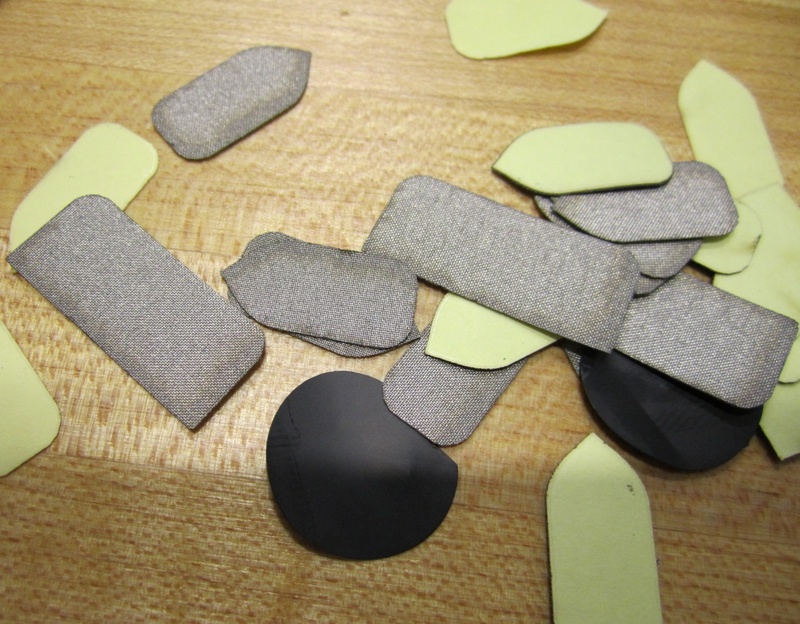 Here’s a bit about the construction process. 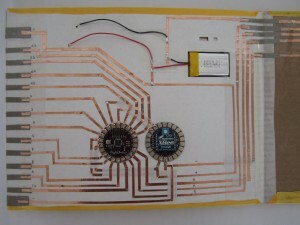 Materials include vinyl-cut paper, copper tape, and adhesive vinyl, laser cut conductive fabric tape, and Velostat. We’re now looking into how to use these stickers without the pre-routed traces that constrain users to predefined footprint locations. If you’re working on flat paper batteries or tiny radios or know someone who is, we would love to talk to you!